The No.1 Overdrive is a tube-like amp on your pedalboard. If you crave a powerful, warm distortion with a dynamic, tube-like sound, prepare to meet your “can’t live without” pedal. Gain one controls the first gain stage from a pure clean boost to a naturally compressing overdrive. Gain two shares one knob with the Bass control. It cleverly controls the gain and the low end of the next gain stage, which adds rich harmonics, bottom end and natural tube-like saturation to your tone. It is designed as an active high-pass filter for the second gain stage and will allow you to set the amount of bottom end with precision. 1. Gain Controls the unity gain of the circuit. 2. Volume Controls the overall output volume of the No. 1. 3. The hi/lo switch is tied directly into the gain. The lo setting offers a warm, tube-like boost and a subtle crunchy overdrive, great for rhythm playing. The hi setting adds saturation, sustain, low end and compression. This setting is recommended for a more powerful rhythm or soloing. 4. Bass Controls the bass and lower mid-frequency gain. The bass is tied into the gain, making it a secondary gain control and enhancing your low end. 5. Treble Control Is a passive, natural sounding low-pass filter. It cuts high end and offers a wide frequency range. Turned clockwise, it becomes raw, aggressive and cuts through. Turned counterclockwise, it cuts highs for a more mellow and warm tone. 6. Footswitch Engages your No. 1 to “on” or True bypass mode. 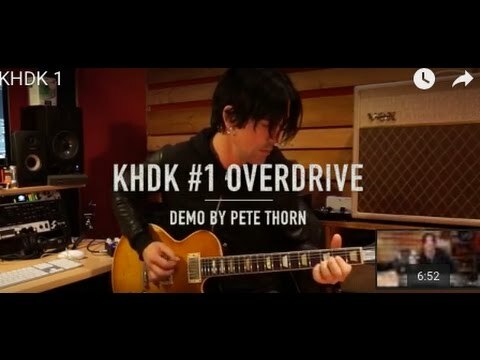 The KHDK No.1 Overdrive is powered by a single 9V battery. You can access the battery connection by unscrewing the bottom plate of the pedal enclosure. Alternatively, plug in an external 9V DC (center negative) power supply.